Our history of dealing vehicles in British Columbia starts long ago, but we will get to that! First and foremost, we are a group of dealerships in the Greater Vancouver Area that are committed to providing quality new and pre-owned vehicles to people from all over British Columbia. This includes Vancouver, Richmond, Surrey, New Westminster, Delta and Burnaby. With three amazing dealerships, we are just a short drive away from any of these cities. We are always excited to meet the people in our community and find them a great vehicle to drive home in. We want to make you feel comfortable in our dealerships and provide you all the information that you need. Our sales team can walk you through the entire purchase process, and then you can drive away in a GM vehicle. Whether it’s a Cadillac, Chevrolet, Buick or GMC you’ll drive home in a vehicle from one of the top manufacturers on the planet. It’s been almost a hundred years since Dueck GM was founded in Vancouver in 1926 and we only have our sights set forward. We are as committed to customer service and quality as we were back then and we are going to carry that into the future. WE hope to push boundaries and provide quality vehicles to everyone who walks through our doors. Dueck Auto Group was founded under three principles: Selection, Value and Trust. These are things that we have lived by since day one. To this day, those values are instilled in everyone who works with Dueck Auto Group. Currently we employ over 400 people between our three state-of-the-art locations that are fully updated. Our locations in the Greater Vancouver Area include: Dueck Downtown, Dueck Richmond and Dueck on Marine. Dueck Auto Group is proud to call itself a representative of the GM Brand. We truly believe that they are a premium vehicle manufacturer. Their commitment to pushing boundaries and innovating within their 4 brands is remarkable. Their vehicles are award winning, quality tested and have great fuel economy which can be seen in all the vehicles from Cadillac, Buick, GMC and Chevrolet. Don’t just trust us though, trust the numbers! Awards: GM vehicles are known to win numerous awards and we are excited when they do. For 2017, they have been named top vehicles in a variety of categories. First and foremost, Motor Trend’s 2017 Car of the Year is the Chevrolet Bolt EV, a brand-new vehicle from GM and Chevrolet. Automobile Journalists Association of Canada (AJAC) awarded the Buick LaCrosse the 2017 Best New Large Premium Car. Quality: For 2016, GM took home seven model-level awards from J.D. Power for initial quality. The winning vehicles were the: Buick Cascada, Chevrolet Equinox, Chevrolet Silverado HD, Chevrolet Silverado LD, Chevrolet Spark, Chevrolet Tahoe, and GMC Terrain. Safety: IIHS has names 6 GM vehicles as Top Safety Picks for 2017: Chevrolet Volt, Chevrolet Malibu, Buick LaCrosse, GMC Acadia, Buick Envision and Cadillac XT5. 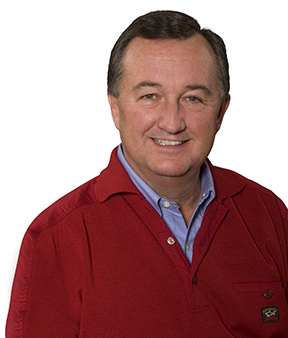 Moray Keith has been a General Motors dealer since 1980, and has been the architect of Dueck’s success since 1987. He has always focused on the idea that successful companies have a responsibility to give back to the communities to which they belong. Moray sits on numerous Boards including the BC Lottery Corporation, the Richmond Olympic Oval Corporation, and the Provincial Vehicle Sales Authority. Moray’s son Greg is also a part of the business, as Vice President of Dueck Richmond. We are very proud of our company’ and our employees’ commitments to our community. Dueck Auto Group is proud to supply auto industry careers to people in the Greater Vancouver Area. The Automotive Sector is very important to the overall Canadian economy as it is the largest manufacturing sector in the country. This industry accounts for 12% of the Canadian GDP, producing over 2 million vehicles per year. Did you know that 1 in 7 Canadians rely on the automotive sector for employment? Over 500,000 people are employed directly by manufacturers and retailers of vehicles in Canada. Here in BC, 350 new vehicle dealerships put $10 Billion back annually into the BC economy, and employ over 34,000 people. We account for 400 of those! We have partnered with and supported many local foundations, charities, and causes, including Canucks for Kids Foundation, BC Children’s Hospital, the United Way, the YMCA and BC Special Olympics, of which Moray’s wife Pamela is the Provincial Chairperson. We are very proud to support many minor sports teams, and have established the Dueck Endowment Scholarship Fund at SFU.